How they particularly affect Canadians with a U.S. birthplace, who lived most of their lives in Canada. You must pay a price to NOT be a U.S. citizen. This tax is found in S. 877A of the U.S. Internal Revenue Code. Few people are aware of this tax. Fewer still understand how it works. As FATCA operates to enforce U.S. taxation on many Canadian citizens, and increasing numbers wish to NOT be U.S. citizens, the importance of understanding the U.S. “Exit Tax” increases. It is particularly important to understand what triggers the “Exit Tax”. You will be subject to the “Exit Tax” if you are a “covered expatriate”. You must know what that means and why, sooner or later, everybody will become a “covered expatriate”. Hang on to your seats. You will shocked, amazed and horrified by this. This will be covered over a 15 day period in a “15-part” series. Although this series is beginning on “April Fools Day”, I assure that this is NOT a joke. Are you or have you ever been a U.S. citizen? It’s time to check! https://t.co/smEH5PAZI4 – The Canadian banks are looking for you. – born in the U.S. The Alliance For The Defence Of Canadian Sovereignty has sued the Government of Canada in Federal Court on the basis that the participation of the Canadian Government in FATCA, is in violation of the Charter Rights of Canadians. You can keep up with their progress on the Alliance blog” which is here. 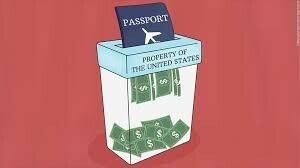 FATCA is a tool to enforce “U.S. taxation in Canada”. The result is that more and more Canadian citizen/residents will be forced to pay U.S. taxes. But, U.S. tax rules include much more than tax. They are source of comprehensive information gathering and “information returns”. Typical returns required by U.S. taxpayers in Canada include: FBAR, FATCA Form 8938, Form 5471, Form 3520, Form 3520A and many more. It’s only Canadian citizens with a past “U.S. connection” who will be subject to these taxes. It is estimated that approximately one million Canadians may be subject (as “U.S. Subjects”) to these rules. But, Canadians with a “U.S. connection” are members of families. Therefore, U.S. taxation in Canada will impact all members of a Canadian family which has at least one “U.S. connected” member. Pingback: The Isaac Brock Society | 26 U.S. Code §877A – The “Exit Tax” rules: Do you see them as applying “prospectively” or “retrospectively” or both? John has added an interview he did with Gordon T. Long on May 22. JR scared the bejesus out of the *US Person* host – and any listeners, with the message that this IS all very real and emphasized that people have to educate themselves and then make the best decisions for themselves and their families going forward. You can watch the youtube video … only 38 minutes long. Hang on to your bejeebers though. A Canadian he has worked internationally before locating his activities to the Boston area of computer, communications & networking technology leadership. He is involved in International private Equity Placements for new technologies. Mr. Long presently resides in Boston, Massachusetts, continuing the expansion of the LCM Groupe’s International Private Equity opportunities in addition to their core financial market trading platforms expertise. GordonTLong.com is a wholly owned operating unit of the LCM Groupe. John, I’m one of those frightened and worried ones so let me put myself right in that camp as a US Citizen as I learn more and more about some of those issues that are now front and centre. John, thanks very much. I appreciate your frankness and honesty — and you have scared the hell out of me this morning. They discuss things FATCA, renunciation if you are to live outside the US, exit tax, PFICs, pensions, etc., all in the context of financial repression in general. Both talk about seeing a monumental shift in how the world is working (with negative interest rates, etc.). They talk about it being an interesting next decade or so – it is not going to look anything like it looks today or anything we could have imagined. Nothing we could have imagined — like FATCA combined with being deemed a US citizen?